Good Grades to Get into a Good College? EXERCISE! Exercise before an exam improves grades! School is starting just now in US and Europe and many parts of the world. Naturally, parents are concerned that their kids optimize learning. In an era when grades measure progress in school and often determine the quality of college acceptances, pressure is on to get good grades! Pressure is on for kids, and also their parents! What can be done to optimize grades? Fortunately research is abundant! First of all, don’t forget what is mentioned in other blogs — adequate sleep is crucial! Staying on topic for this blog, though, another realm with voluminous research is focussed on effects of exercise on grades! In 2013 I read a book [Spark: the Revolutionary New Science of Exerciseand the Brain by John J. Raley and Eric Hagerman] that revolutionized my thinking. It told a an amazing story! A school in Naperville, Illinois, was struggling mightily because of limited budget. Their school performed lowest in the school system. With limited funds, they brought in a gym teacher who emphasized vigorous exercise and monitoring heart rates. No other changes in curriculum occurred. Within a few years, this school scored sixth in math and FIRST in science in the WORLD! This was the TIMSS competition that had previously been dominated by China, Japan, and Singapore! This remarkable performance has now exploded into a movement and has inspired extensive research! 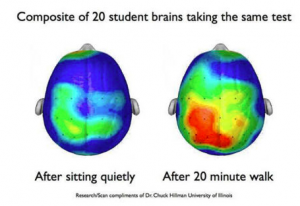 One impressive study shows the effect of just 20 minutes of walking, jogging, or playing tag before taking an important exam. Not only did those 9 and 10 year-old kids perform better on the exam, but MRI results were very dramatic! Exercise increases activity of learning centers! In this study, the control group sat quietly before the exam, while the test group exercised. The MRI was taken immediately after the exam!